Laura Richardson was the Democratic representative for California’s 37th congressional district. She served from 2007 to 2012. Richardson was born in Los Angeles on April 14, 1962, to a black father and white mother. Her mother Maryann Richardson, who was a member of the Teamsters labor union, raised Richardson by herself. Richardson graduated from UCLA in 1984 with a bachelor degree in political science. She then worked for the Xerox Company for several years before earning her MBA from the University of Southern California in 1996. Next she worked as staff for Juanita Millender-McDonald, Democratic Representative for California’s 37th congressional district for two years. In 2000, Richardson won a seat on the Long Beach City Council, where she served until 2006. As a Long Beach councilwoman, she was instrumental in bringing the first new bank to the Central Area of Long Beach since the riots of 1992. She was also responsible for opening the first job-training center for working families in Long Beach’s inner city, and for gaining the first funding for alley maintenance by the City of Long Beach. Richardson ran for the 55th district seat on the California State Assembly in 2006 and won. Her position as the assistant speaker pro tempore in the assembly made her the first African American to hold this position. 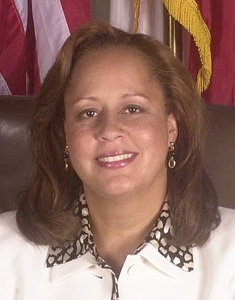 In 2007, Richardson was elected to Congress to represent the 37th district, replacing Juanita Millender-McDonald who passed away April 22nd, 2007. This made her the 27th African American female to be elected to the House of Representatives. Richardson served in the House Transportation and Infrastructure Committee and the Committee on Science and Technology. Early in 2009 Richardson was investigated for violating gift and financial disclosure rules with respect to her home, its foreclosure, and yard work from 2007 to 2008. The House Committee on Standards of Official Conduct concluded that Representative Richardson did not knowingly receive and/ or fail to report the aforementioned gifts. However, in August, Richardson was found guilty on seven counts of violating House rules by improperly pressuring her staff to campaign for her, destroying evidence and tampering with witness testimony. Richardson was ordered to pay a fine of $10,000 within four months and promised to require staffers who work on her campaign to sign a waiver stating that they haven’t been pressured to do so. Richardson lost her bid for reelection in 2012. Rachel Kapochunas, “Early Brush With Racism Set Rep.-Elect Richardson on Political Path”, CQPolitics.com, August 22, 2007, https://web.archive.org/web/20070926231437/http://www.cqpolitics.com/2007/08/early_brush_with_racism_set_re.html; Anthony York, “Debate intensifies over Richardson home default,” CapitalWeekly.net, May 22, 2008, https://web.archive.org/web/20080525201939/http://www.capitolweekly.net/article.php?_adctlid=v%7Cjq2q43wvsl855o%7Cx4qkjhxlldwn8k&issueId=x48gnuowgqsg6o&xid=x4ptlrmv0w0r6x; Ben Pershing, “Ethics Panel says Richardson broke federal law, obstructed probe,” TheWashingtonPost.com, August 1, 2012, https://www.washingtonpost.com/blogs/2chambers/post/ethics-panel-says-rep-laura-richardson-broke-federal-law-obstructed-probe/2012/08/01/gJQAf0FNPX_blog.html.